This will be great for my mother in law who loves Mushrooms..all kinds. I will probably make a version for her without eggs. 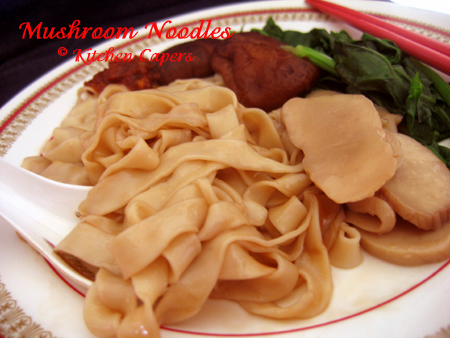 The noodle is very fragrant with the smell of tea-smoked preserved mushrooms. Here's how it looks like blanched and toss with Oyster sauce. **mushroom water is made from soaking preserved/dried mushrooms. Retain this dark brown liquid..you may need to sieve to remove any dirt in it. 1. mix all the ingredients to form a dough. No need to rest the dough. 2. Break into smaller pieces and run it thru the Pasta machine till it runs out smooth. 3. Dust with flour and run it thru the cutters(either one will do). 4. 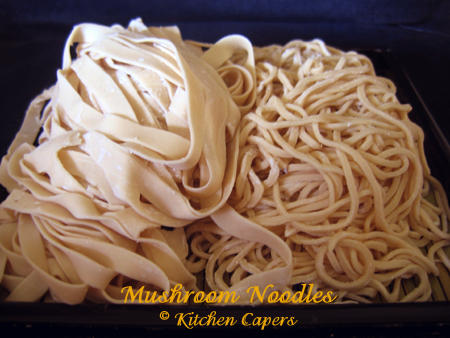 Add 1 tsp of flour to toss with the cut noodles. 5. Use it as per your recipe. You can make this by hand or by a cake mixer that can handle bread kneading. If you use KitchenAid mixer or Kenwood mixer, just knead till it forms into a smooth dough(about 5 mins). Don't over knead. Then remove the dough from the mixer, roll out till very flat. Cut and dust with flour. how many pieces of mushroom you soaked in the water? I almost smell the fragance here! if you get those good quality ones from Japan, only need 5 to 6 pieces. If they are from China, you need at least 10 pieces. thanks to let me know... will do it soon, but I think I'd dream about it tonight! I boiled the noodles very briefly, rinsed with cold water, drained very well, heated the wok with veg oil, sesame oil, chopped chilli, soy, stir-fried the noodles (just a short time). Wha-la, so yummy, and the noodle very bouncy too! 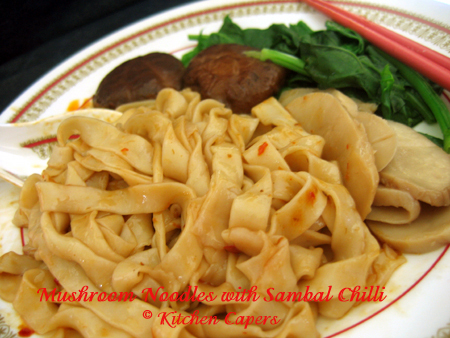 Thank you Gina, your noodle's fragrance is just right, this recipe's definitely a keeper! the soak in water after its cooked was a tip from Pauline. to help to keep it bouncy later. glad you liked it too. Its so good that you don't even need any meats in it. just more mushrooms and some green vegetables. ai ya, I hungry now looking at yours.